Tina's Crop Shop: GIU Post #3 - Everyone You Meet! Beautiful card and the sentiment is so true. I really like the rounding off of the two corners. I have seen that done on panels for a card before, but not the card base too. Thanks so much Denise. I agree that the sentiment is really so true! I cannot tell you how much I love this sentiment. This card is very nice. Thanks Traci! I feel the same way about this sentiment.. it is so true! Love the sentiment. pretty card, too. lovely colors. 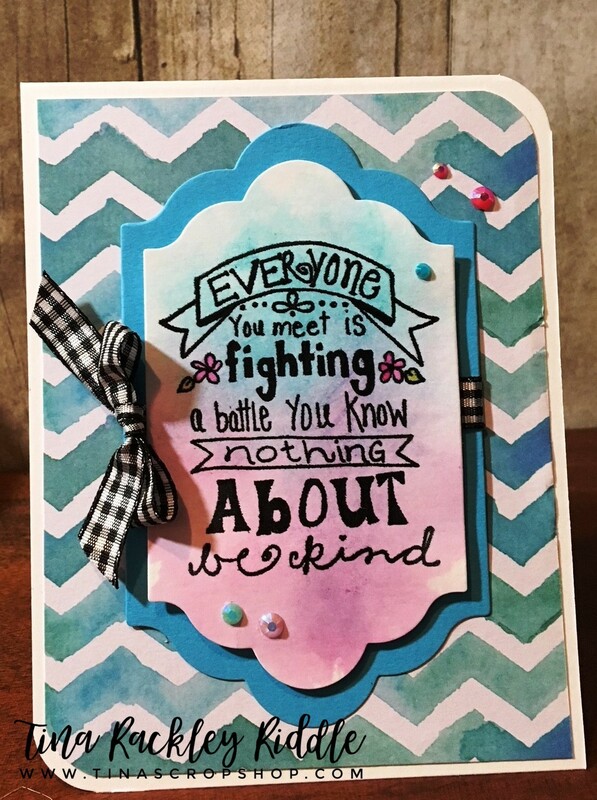 I love to use bold sentiments on the front of cards from time to time.. this is a nice big one and was easy to use. Thanks so much Wilma! I appreciate you stopping by! I like how you rounded the two edges of the card. The watercolor smootching looks great! Such an awesome sentiment ... and so very true! Thanks so much and I definitely agree that the sentiment is so very true! Thanks for stopping by! I love this sentiment and the pretty chevron background Tina. Lovely card!! What a nice card. Love the colors. Thank you so much Marcy! It's an awesome sentiment for sure! Thanks so much! I love this sentiment as well.. one of my favs! Your card is absolutely lovely! Thanks so much Beth! I appreciate you leaving me some love. Love the sentiment and your pretty background! Thanks so much! I appreciate you stopping by my friend! Thank you for the details it’s a pretty card. You're welcome. Thank you and I appreciate you stopping by! I think it turned out really well too - well done! True sentiment. I like how you made it so bright and pretty. Thank you Sharon! I appreciate you stopping by! Awesome card,love the colors and the sentiment. I've used it always inside the card,thanks for this new idea. I'll be using it soon! Thanks April! Turquoise/Teal is my favorite color.. I tend to use it a lot! Pretty card, love the words! Love your card, the sentiment is awesome! Thanks so much! I love this sentiment too! What a great sentiment! Love your card. Using the SU Lots of Labels dies is perfect for this sentiment. Thanks so much. I thought the Lots of Labels dies worked really well too! Thanks for stopping by and leaving some love! Wow, your watercolor is so nice and your details are incredible. I haven’t tried watercoloring yet. Must try it! Nice Card! Such a good sentiment!!! Great card, and love sentiment. Some of us fight battles that are not seen. I need to get this stamp, I deal with anxiety attacks and people can be cruel in comments "its all in head", "get over it" etc. I wish it was that easy. Great card design and sentiment. What a beautiful saying! Very nicely framed and embellished with this card! Good job! The unexpected elements in your card come together nicely: the rounded corners, the pop of pink and the black and white bow. Lovely! What a super cute card! And I agree it’s an awesome sentiment! I like the card, and especially the sentiment! It’s a sentiment that never gets old and I really like the way you presented it. I really like how you did a sentiment feature with this one. A good reminder to use the sentiments I have. I love that sentiment - it's something we should all try to keep in mind!. 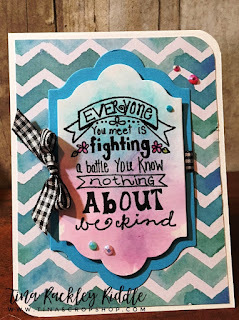 Love the colors of s=distress ink you chose - they really make the sentiment pop! Such an important reminder! Pretty card! I simply love the color combo here! And the sentiment is one of faves in 2017. Great card with a gorgeous color combo !